ITBP Head Constable Recruitment Notification PDF Download - Get Here Complete Notification details, eligibility criteria. LAST DATE OF RECEIPT OF ONLINE APPLICATION: 07.02.2018. Rs. 25500 – 81100 (as per 7 th CPC). Rs. 21700 – 69100 (as per 7 th CPC). The post will carry Dearness Allowance, Ration Money, Washing Allowance as admissible from time to time, Special Compensatory Allowance while posted in specified border areas, free uniform, free accommodation or HRA, Transport Allowance, Free leave pass and any other allowance as admissible in the Force from time to time under the rules/instructions. They will be covered under New Restructured Defined Contributory Pension Scheme. Total vacancies include Backlog vacancies and may vary due to administrative reasons. 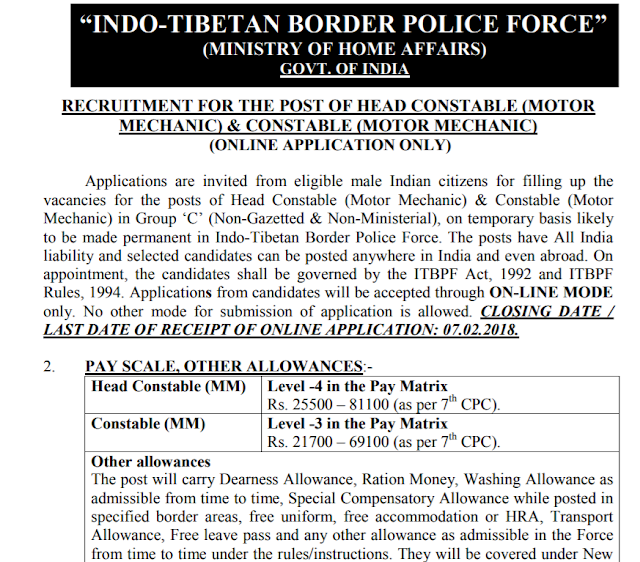 ITBP reserves the right to make changes in sequence of the recruitment process after publication of this advertisement. ITBP also reserves the right to cancel or postpone the recruitment at any stage without assigning any reason. 10% of the vacancies are reserved for Ex-Servicemen. In case vacancy reserved for Ex-servicemen remains unfilled due to non-availability of eligible or qualified candidates, the same shall be filled by other candidates.